These socks bring a Mensa-worthy touch to any little one's wardrobe. Is budding genius all in the brain? With these playfully brainy socks, it might just be in the toes. 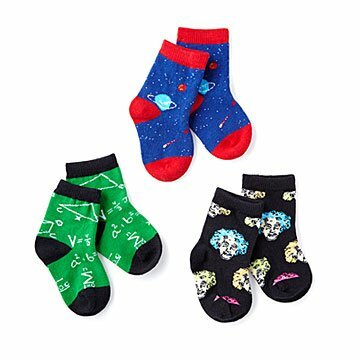 Decorated with the fluffy-headed likeness of Einstein, outer space, and chalkboard equations, these socks bring a Mensa-worthy touch to any little one's wardrobe. Nobel Prize not guaranteed. Set of three. Fits 6-12 month tootsies. Made in South Korea. Machine wash cold - do not bleach. Tumble dry low.